It’s actually quite difficult to articulate the specifics of what doula’s do, how we positively impact the space for one woman will be different to the next, however, it is this ability to connect with each individual and support her in the way she needs to be supported in that exact moment that is the ‘art form’. hours or whether you require vocal encouragement and physical touch. She will also constantly check in with you in a gentle and respectful way ensuring the balance of support is maintained with you and your partner throughout the journey. How do you put into words ‘holding the space’ or describe the intense feelings you have when you’re supported in such a deeply connected way? • Do you want a hospital or home birth, what books to read, what classes to take, what workshops to attend… the list goes on. • Do you worry about the pain of giving birth? • Is your partner confident about providing effective comfort and support during labour? • Are you confident in your partner’s ability to support you? • Are you unsure about how to go about making an informed choice about your health? • Do you know what you would do if your birth wasn’t progressing as you planned? • Have you heard horror stories and just cannot get them out of your mind? A doula offers one to one continuous care to you and your partner during pregnancy and helps prepare you for labour and birth focusing on a gentle and supported transition into parenthood. Meeting with your doula is a dedicated time that you and your partner set aside to actively prepare yourselves for the birth you want. A perfect opportunity for you to have each other’s absolute attention and focus on all things birth related. Most doula’s will meet with you and your partner in your home leading up to the birth and work through natural pain relief techniques, arm you with resources, connections in your local area specific to your needs, teach you breathing and calming techniques, perhaps visualisations, mantras, affirmations. Labour positions, birthing positions and discuss your birth plan in detail. She will have the ability to answer your many questions and know when to direct your questions to your chosen medical professionals. She will explore your birthing preferences and advocate these for you, and she will sit with you and your partner and listen to your needs, desires, fears and concerns. She will help you navigate your way through the birth journey with an in-depth knowledge of you, your partner and all of the specific little stories you have shared together. A doula will perhaps know about your wedding day or a favourite holiday and be able use these happy times as a source of distraction or re-focus during labour. She takes the time to really understand you as a person and does her best to support all of your needs during labour and birth. Simply put she ‘holds the space’, she keeps the tempo up when needed or reminds new arrivals into the birthing space that this is a time for quiet, in the most direct yet polite and respectful way. ”Oh what a skill this is at times”! In many cases the birthing woman’s partner needs just as much emotional support during labour as the woman herself and a familiar face for the partner to check in with throughout times of stress or uncertainty is incredibly valuable. I call it eyeballing. The dad’s or partners will often remain silent but constantly eyeball me to check in that the situation is ok, under control or ‘normal’. And the more a doula gets to know your partner the more comfortable he/she will feel. As your doula gets to know you in pregnancy she will have a good understanding of your emotional stability and be in a good position to seek out alternative specialised help for you postatnally if needed. Have a chat with us if you are curious to explore Birthready doula support at your birth. Both my husband and I believe hiring a doula was one of the best decisions we made in the quest for our daughters natural births. I had little understanding during the first labour of what our doula was doing as I was so deeply zoned out – (or zoned in!) and upon reflection I put this deep zoning out down to the preparation with my doula during our sessions together, we got to know each other, she knew me and my husband and I trusted that she would look out for me during labour so I was able to labour with little interruption while I knew she would protect my birth space and she would adhere to our birth plan. During my second labour I absolutely knew what she was doing, I was taken somewhat by surprise by the speed of the second labour and she held me though this intense time. She also supported my husband as there wasn’t a moment for either of us to ‘get everything ready’. “As first time parents the thought of entering this ‘unknown territory’ of birth can easily rattle the strongest intentions; however our doula’s confidence and support every step of the way was so special and integral in building our own confidence too. 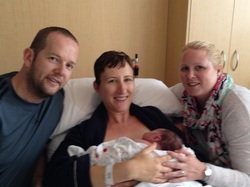 Her tireless support of us both as my labour progressed was simply amazing – even better than I had imagined! We truly believe that we would have been in the hospital much sooner and quite possibly finding ourselves following a path of interventions we were hoping to avoid had it just been the two of us. During my labour we both agreed that it felt like we were 3 best friends working together in our own little bubble and I was comforted knowing that my husband felt like he could really help me and was also able to rest when he needed to. Being a doula would have to be one of the most personal positions someone could ever hold, and our doula had just the right blend of familiarity and professionalism that this delicate role requires. We are so thankful that we found our doula”. “As we were booked in at a public hospital under team maternity care, I was not able to see the same midwife for each pre natal appointment. Having our doula to talk to each week allowed my husband and I to maintain consistency. She knew our history, helped us understand our birth presences, and knowing she’d be in the room with us on the day gave my husband and I peace of mind. She helped to create an environment that promoted calm. Although our birth was too short to be able to use the tools our doula had shared with us. My doula was the key to my positive attitude about birth, and I firmly believe that without her my husband and I would’ve been a lot more unsettled. Our doula focused on my face and my state of mind. Knowing the tools I had available to use during birth, allowed the midwife to focus solely on my physical state. A midwife has such a large task of calming down the mum & dad, plus working through all the physical aspects of birth- they were very thankful (as was I) to have our doula there to keep me calm! She was able to apply physical pressure where it was needed, she also directed my husband of how and where to massage, which meant he felt he was applying the best technique for pain management. He didn’t feel lost or unsure of how to help me. My husband was able to focus on looking into my eyes, and on the baby. This was a special moment for us that may not have been possible without a doula. My husband was very thankful to have a doula in the room with us. A special type of person has the skills to be a doula. Their job is to enter the most personal of spaces with a couple and to make them feel comfortable enough to really experience the wonder of childbirth”. You only have one opportunity to birth your baby. Talk to your partner about how they feel about having a doula on board. Prioritise this time for yourself and do everything you can to make your pregnancy and birth the best it can be. My wish for all couples is to feel in control, knowledgeable, loved, safe, nurtured and listened to in labour. I trust that you all experience a positive and empowering birth and have a beautiful birth story to share with your friends, family and the next generation.